We are garden fairies and we are providing an update on the vegetable garden, but first we wanted to write a few words about some of the re-bloom that is going on around here. In all our years of being in and around gardens, which is more years than you have fingers and toes to count on, unless you are some kind of, well never mind, we are garden fairies and we would never say anything about anyone who isn't normal. Let's just say that in all the years we've been around gardens, we have never seen such re-bloom in the fall as we have seen this year. We guess it is because the Drought of '12. Whew, that was a hot, dry summer. 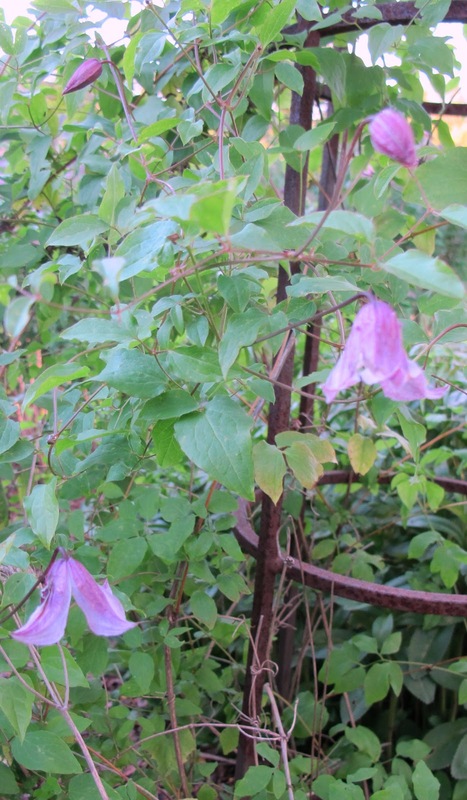 Now we are seeing new blooms on many plants including Clematis 'Pagoda', which we have posted a picture of to lure you in to read this blog post. There are other re-blooms, but if we go on and on and on about those, we will go too long and no one will read about the vegetable garden. We are garden fairies and we want to tell people the truth about the vegetable garden. First we would like to report that we have never seen so many weeds in a vegetable garden as there were in Carol's Vegetable Garden Cathedral. But she spent considerable time a few weeks ago weeding and weeding and weeding and we garden fairies think she did a pretty good job of it. Ha ha. While she was weeding, we hid her hori hori knife when she had her back turned. Oh, my, that was sure funny watching her look for it. 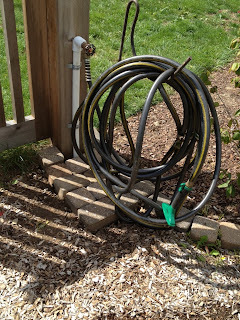 We had a water spigot in the vegetable garden. Then Carol came along and hooked up a hose and well-what-do-you-know, we have running water right here in the vegetable garden. Apparently not because then Carol came back out and cleared off a bunch of the beds that were full of stuff no longer producing food, like corn and okra, and sowed some green manure crop seeds and also planted some seeds for spinach. We were grateful to her for doing this, so we returned her hori hori knife to her when she wasn't looking. 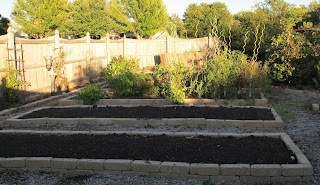 Now the vegetable garden looks like this. The only thing left is tomatoes and peppers. And then you will not believe what happened next. Frost. In the garden. There was frost in the garden this morning. Yes, there was frost this morning. It was a light frost so it didn't totally blacken the tomatoes and peppers but it sure didn't help matters. We think that Carol will be out soon to clear off the rest of the vegetable garden and then all that will be left for us garden fairies to do is watch the spinach and green manure crops grow and of course, attend the ceremonies of last rites that the right reverend Hortus Augustus McGarden will perform on all the plants that end up in the compost bins. His mother, Granny Gus McGarden, will provide the music for the service. 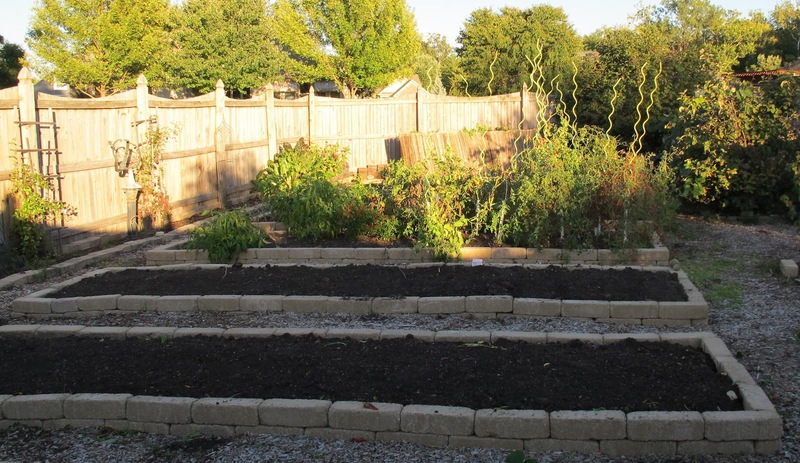 It is very moving and marks the end of the main season of vegetable gardening. Thorn Goblinfly, Chief Scribe and Observer for the Garden Fairies at May Dreams Gardens. I never tire from hearing from the garden fairies, they make my day. I am glad that they found it in their hearts to return the hori hori knife. Happy Autumn. I don't know how Carol managed to grow such great vegetables all these years without a water spigot nearby; she's going to love this. And on hot days, now all of you can turn on the sprinkler to cool off! Wish I could be there for the last rites ceremony with Rev. McGarden! Great update - not unlike what is happening at the End of the Road. We got our first frost this morning too.